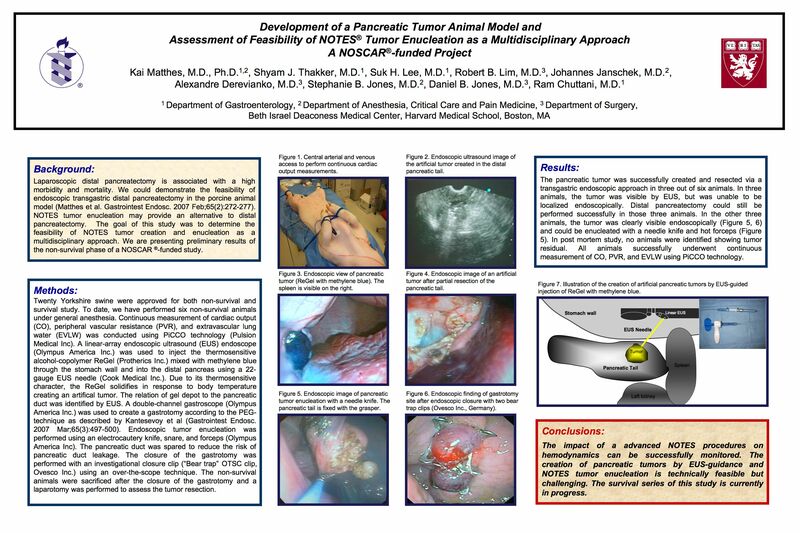 Development of a Pancreatic Tumor Animal Model and Assessment of Feasibility of NOTES™ Tumor Enucleation As a Multidisciplinary Approach – a Noscar™-funded Project. BACKGROUND: Laparoscopic distal pancreatectomy is associated with a high morbidity and mortality. We could demonstrate the feasibility of endoscopic transgastric distal pancreatectomy in the porcine animal model. NOTES tumor enucleation may provide an alternative to distal pancreatectomy. The goal of this study was to determine the feasibility of NOTES tumor creation and enucleation as a multidisciplinary approach. METHODS: Six Yorkshire swine underwent general anesthesia with continuous measurement of cardiac output (CO), peripheral vascular resistance (PVR), and extravascular lung water (EVLW) using PiCCO technology (Pulsion Medical Inc). A linear-array EUS endoscope (Olympus America Inc.) was used to inject the thermosensitive alcohol-copolymer ReGel (Protherics Inc.) mixed with methylene blue through the stomach wall and into the distal pancreas using a 22-gauge EUS needle (Cook Medical Inc.). Due to its thermosensitive character, the ReGel solidifies in response to body temperature creating an artifical tumor. The relation of gel depot to the pancreatic duct was identified by EUS. A double-channel gastroscope (Olympus America Inc.) was used to create a gastrotomy according to the PEG-technique as described by Kantesevoy et al. Endoscopic tumor enucleation was performed using an electrocautery knife, snare, and forceps (Olympus America Inc). The pancreatic duct was spared to reduce the risk of pancreatic duct leakage. The closure of the gastrotomy was performed with an investigational closure clip (“bear trap”, Ovesco Inc.) using an over-the-scope technique. The non-surivial animals were sacrificed after the closure of the gastrotomy and a laparotomy was performed to assess the tumor resection. RESULTS: The pancreatic tumor was successfully created and resected via a transgastric endoscopic approach in 3/6 animals. In three animals, the tumor was visible by EUS, but was unable to be localized endoscopically. Distal pancreatectomy could still be performed successfully in those three animals. In post mortem study, no animals were identified showing tumor residual. All animals successfully underwent continuous measurement of CO, PVR, and EVLW using PiCCO technology. CONCLUSIONS: The continuous impact of a complicated NOTES procedure on hemodynamics can be successfully monitored. The creation of pancreatic tumors by EUS-guidance is feasible but challenging. NOTES tumor enucleation is technically feasible and could be an alternative to distal pancreatectomy. The survival series of this study is currently in progress.